The Performing Arts Showcase is held daily throughout the Festival. Featured at these stages are a diverse range of ethnic performances, from Japanese folk dances to traditional Korean drum performances to colorful Chinese dragon dances. Various cultural groups from Japan and Hawaii bring out their finest costumes and put on a show to remember. Many of the performances from Japan are distinctive to various regions of the country, depicting local folklore and traditions. The traditional cultural acts from Hawaii also include various ethnic groups such as Okinawa, Thai, and Filipino traditional arts groups. It is a rare opportunity to see these cultural presentations with traditional costumes and instruments performed all on one stage! Don’t miss your chance to see these very unique and interesting performances and art forms including the popular Japanese Taiko drumming. 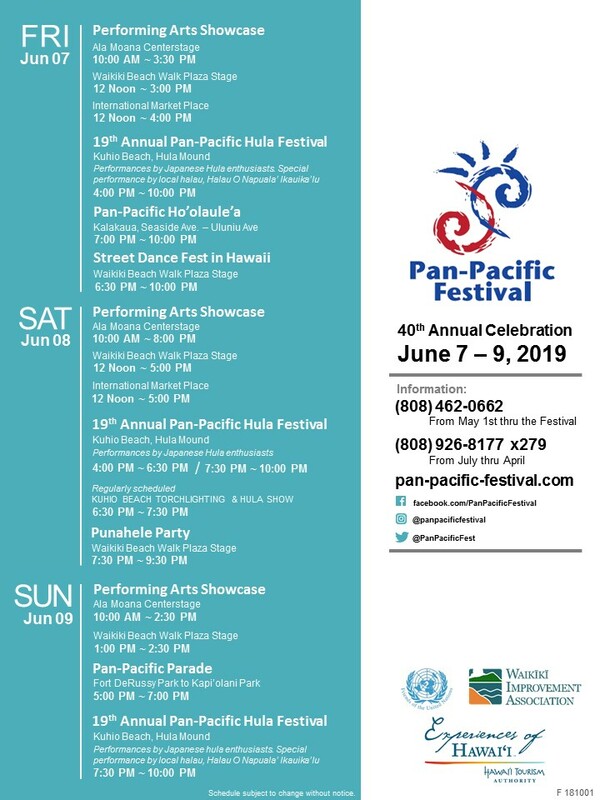 Performing Arts Showcase happens on all three days of our festival at three popular locations: Ala Moana Centerstage, Waikiki Beach Walk Plaza Stage, and the International Market Place. Enjoy a fabulous day of shopping, eating and people-watching at any of these terrific venues!